ST LOUIS/ GASCONADE- Looking at this picture taken by Roamin Rich, it presents more volumes than words can ever describe. The Great Flash Flood of 2017, which has been occurring since 30 April but the worst of it was during the date between then and 3 May, can be compared to the one from 2008 in the Midwest in terms of its massive flow of water and the destruction that was left behind. Hundreds of houses and businesses, many of them more than 80 years old and considered historic, were washed away, and with that the livelihoods of families and business owners. Many roads were washed away, however, as you can see in the Route 66 Bridge at Gasconade, closed to traffic since 2015, the undermining of asphalt uncovered the original concrete roadway that was laid there when the highway connecting Chicago and Los Angeles via Tulsa was designated and built in 1926. This leads to the question of whether to uncover the rest of the roadway and restore the concrete or pave it over. This is important because the debate is heating up regarding ownership and planned restoration of the structure and the Missouri Department of Transportation’s plan to construct a new bridge alongside the two-span truss bridge and defer ownership to a party willing to repurpose it for recreational use. But that is another story (click here for more about this bridge). But the Gasconade Bridge also represents several bridges that were negatively affected by the floods. Several structures in Missouri alone have been destroyed- not just historic bridges but also modern bridges built in the 1970s and 80s, thus making them just as vulnerable to catastrophes like this as their predecessors. James Baughn has compiled a list of bridges affected by the flooding for the Bridgehunter.com website (which you can click here for more details). The Chronicles will summarize the top five that are affected besides the Gasconade Bridge, whose repair work will obviously will be needed in order to make it passable again. We will keep you informed on the latest in Missouri, as clean-up efforts are underway. Bruns Bridge- Located over the Meramec River south of Moselle in Franklin County, this 1888 structure was the product of the King Bridge Company of Cleveland, where they fabricated the steel and one of Zenas’ sons, George, whose bridge company was located in Des Moines, oversaw the construction of the pinned connected Pratt through truss with X-frame portal bracings. The 193-foot span was knocked off its foundations and rushing waters slammed it into its replacement span, turning it into twisted metal. A video of the disaster describes it in details. With Franklin County eager on demolishing the remaining truss bridges in the county because of liability issues, one cannot expect this bridge to be restored unless it is relocated out of state, which is currently being sought in Winneshiek County, Iowa after the collapse of the Gilliece Bridge because of an overweight truck. James Bridge- Ozark County faces at least 20 bridges that either have approach spans wiped out, severely damaged by flooding, both or completely destroyed. The James Bridge over the North Fork White River at Highway PP represents the last variant but in a spectacular fashion. The 1958 bridge, consisting of two polygonal Warren spans with riveted connections that were built by J.W. Githens, was flipped over by rushing waters, crushing the trusses under the weight of its own decking. Originally slated for replacement, this disaster will surely expedite the process as the highway is heavily traveled. 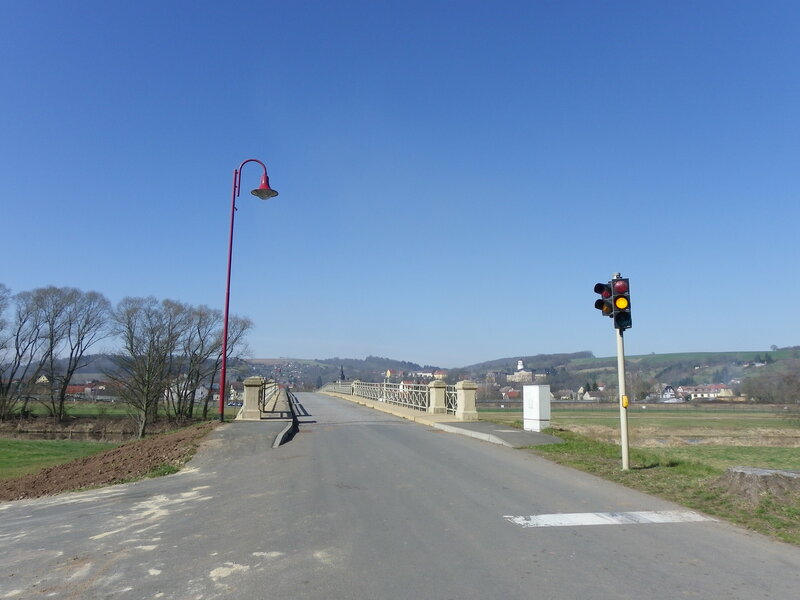 But motorists will have to wait a few months before a crossing can be built. Irwin C. Cudworth Memorial Bridge- Also known as the Hammond Bridge, this North White River Crossing at Highway CC represents a bridge type that is modern on one hand but is still not safe from the floodwaters. The 1975 steel stringer span was wiped out by floodwaters, leaving just the piers and abutments in tact. Despite plans for rebuilding the bridge, one will really need to examine what type of bridge to be built and how high it should be built. Regardless of material and type, no modern bridge is safe from mother nature. This bridge is the eighth modern bridge built after 1975 that has been destroyed since 2012. This includes the infamous interstate bridge collapse in Atlanta, which happened on 30 March, which was caused by a fire. That bridge, which carries Interstate 85, is being rebuilt and should reopen later this summer. Devil’s Elbow Bridge- Another US 66 Bridge located over Big Piney River in Pulaski County, this two-span Parker through truss structure, which was built in 1923, had been restored and reopened to traffic in 2014, yet flooding put the structure partially underwater. 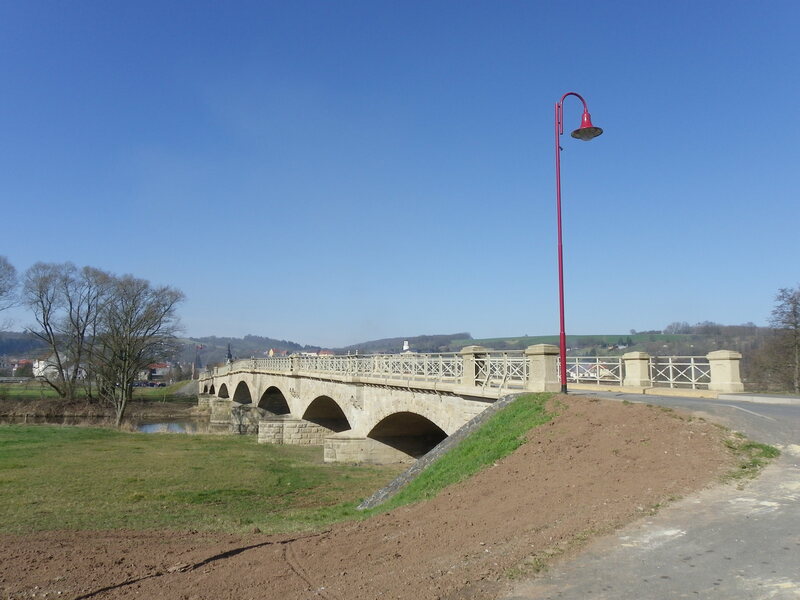 Fortunately, because of the success of the restoration, the bridge withstood the pressure from the rushing water, plus debris from the nearby historic hotel and houses that succumbed under the pressure. Plans are underway to rebuild the hotel. Windsor Harbor Bridge- Located over Rock Creek near the Mississippi River in Kimmswick in Jefferson County, this bridge is of growing concern as floodwaters of the mighty river has inundated the structure, causing concern for undermining the piers and abutments of this through truss bridge. The bridge was built by the Keystone Bridge Company in 1874 at its original location in St. Louis. It was relocated to its present site in 1930 and was converted to pedestrian traffic when it was restored and repurposed in 1985. It’s well noted because of its Keystone columns and ornamental portals, all constructed with wrought and cast iron. As far as the two bridges are concerned, their futures are in doubt, as fire burned away the wood decking of both spans, leaving a truss superstructure standing. This is the first time since 2013 that a fire did considerable damage to a historic steel truss bridge. The Bunker Mill Bridge southeast of Kalona, Iowa was set ablaze during the Historic Bridge Weekend in August 2013, causing significant damage to the bridge decking and bridge parts. 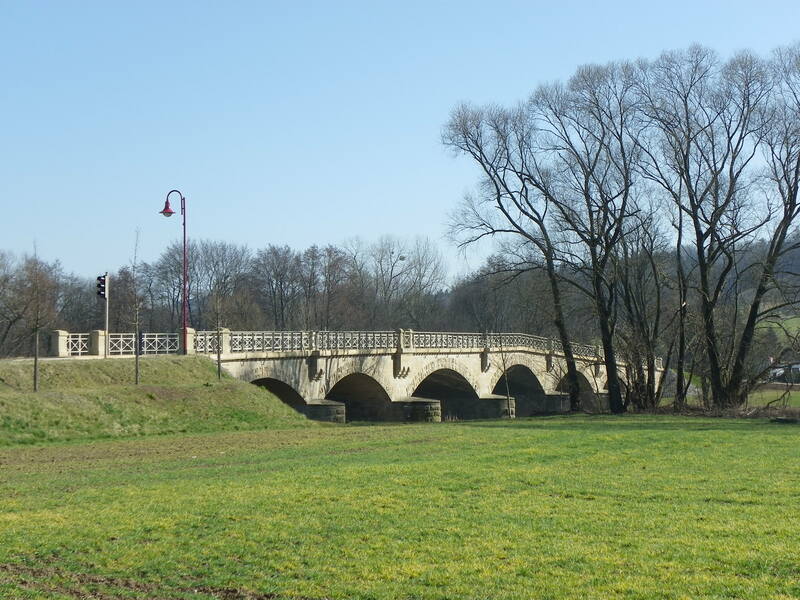 That bridge has since been repaired and is being used as a venue for summer open-air concerts. 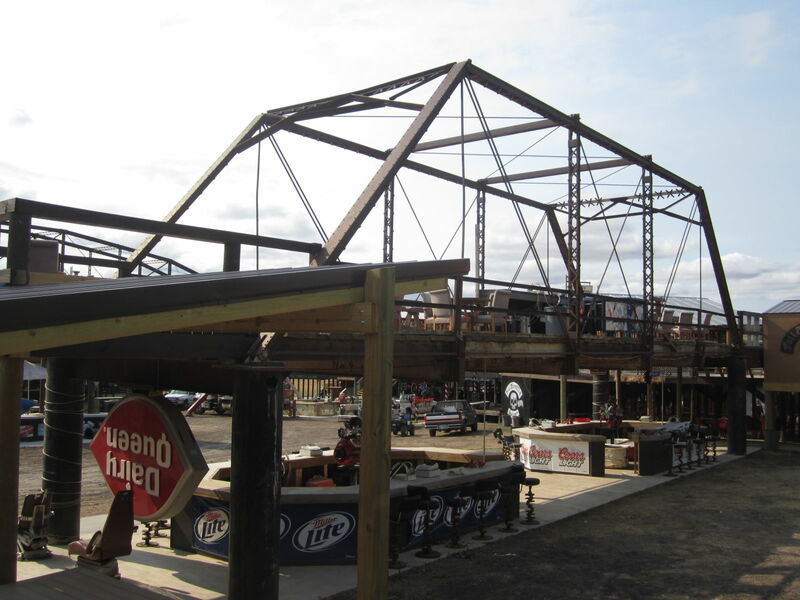 The two bridges damaged by the Full Throttle Saloon fire were each built in 1912 and had spanned the Belle Fourche River before being relocated to the Saloon in 2008, to be used as an observatory deck for concerts and other events. Both bridges were built by the Canton Bridge Company in Ohio and are listed on the National Register of Historic Places. The difference between the two is the length and bridge type. The shorter span, measured at 79 feet, is a pin-connected Pratt through truss bridge with A-frame portal bracings, decorated with X-lattice at the top- typical of the Canton bridges. 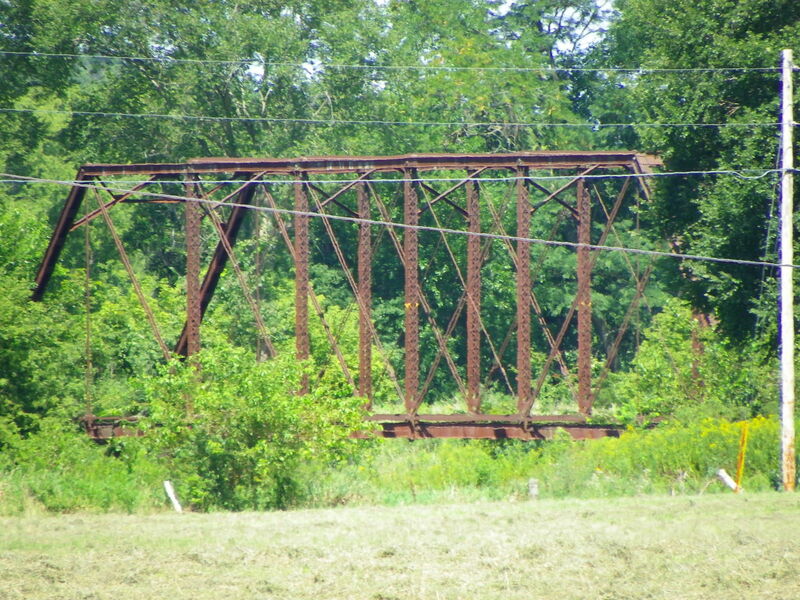 The longer span is a Pennsylvania Petit with A-frame portal bracings and V-laced vertical posts. The bridge is approximately 200 feet long. While the cause of the fire is being investigated by the state fire marshal, scores of letters of support are being poured in on the Saloon’s website and facebook pages in hopes that the place will be rebuilt. Whether and how this will happen, let alone whether these two bridges will be reconstructed or converted to scrap metal will depend on a series of inspections to be conducted by engineers and other architectural experts. These will be conducted in the coming months. But for now, tourists, bikers and bridge enthusiasts are mourning the loss of one of the most popular gatherings in the country, littered with vintage signs and other items that had once provided a nostalgia of a now bygone era, where the biker can pack little but travel cross country to see the wild west, stopping at places like this one for a good beer and good company. For many, Full Throttle will be missed, but another better one will take its place. And hopefully, the bridges and the salvageable can be used as part of a bigger meeting point for bikers. Note: The Full Throttle Saloon won the Amman Awards for the Best Example of Historic Bridge Reuse in 2011. It was also the site of the 75th annual Motorcycle Rally this year. More on that here. The Bridgehunter’s Chronicles will keep you posted on the latest on the future of Full Throttle after the blaze. You can visit their facebook page to provide them with some support for rebuilding the facility. 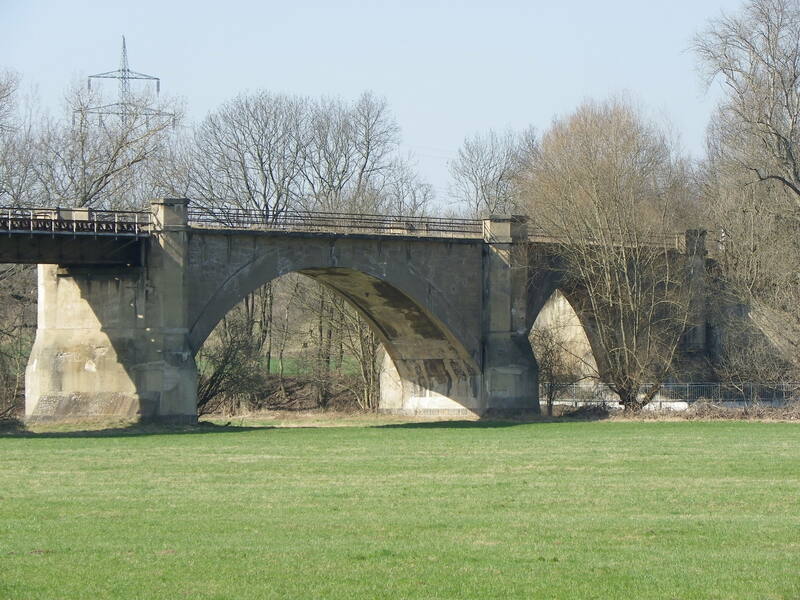 KUTZENHAUSEN-BUCH/ AUGSBURG- The Rothbrücke, located in the district of Augsburg in the community of Kutzenhausen has been in the news recently because of a rather interesting story that is making residents and Bavarians scratch their heads as to how this could happen. The 40-50 foot long beam bridge with concrete decking that spans a small creek has come under attack from an unlikely source, and it has caused the mayor to pursue measures to demolish and replace the bridge with haste. Beavers have been busy taking the bridge apart, piece by piece, where they have undermined the bridge’s abutments and wingwalls by digging several holes behind it, as well as along the shoreline surrounding it. The abutment supports the decking of the bridge, whereas the wingwalls allows water to flow freely under the bridge and keep the dirt back. 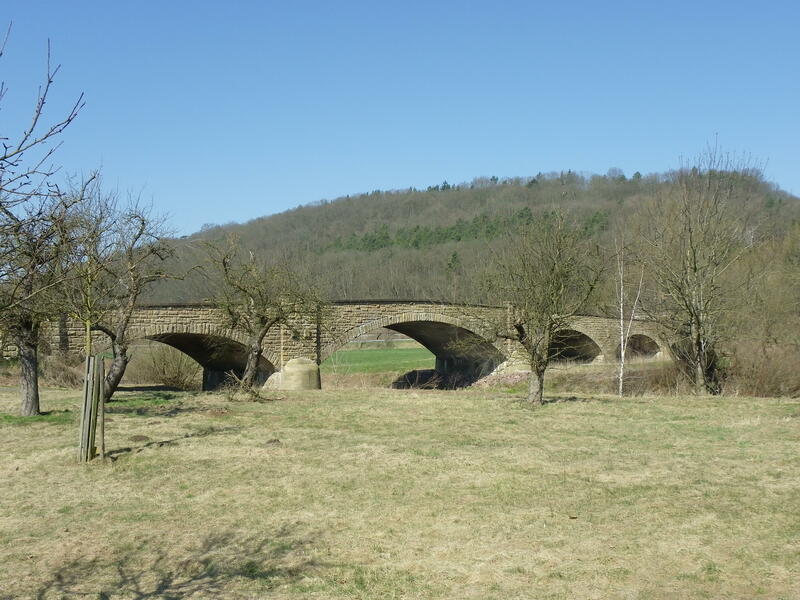 The end result of the beaver’s work has been the area having several holes and tunnels at and behind the abutments, making it look like Swiss cheese, according to reports by the newspaper, Augsburger Allgemeine. The problem was first discovered in 2010, resulting in the weight limit of 3.5 tones being imposed on the bridge. But it was not enough for the beavers to widen their tunnel network and bring the bridge to a point of collapse. According to the mayor, Rupert Kugelbrey, the abutments are so undermined that the bridge could collapse at any moment. While the bridge has been closed off to all traffic including pedestrians since the end of February of this year, plans are now in the making to remove the bridge at the earliest possible convenience for safety reasons. Whether there will be a replacement for the 40+ year old bridge to follow remains open. But it has provided locals and pontists with some humor, as the beaver is being talked about among the social network community. And it is no wonder, for beavers have a potential to bring down trees and dam up streams, causing flooding. That they have the potential to destroy bridges by undermining important parts is something that is going to have engineers look at other ways to keep wild animals from destroying other bridges, regardless of age and materials used. For this beaver, it will have to find other bridges to undermine, once the Rothbrücke is removed, but not before receiving the Chronicles’ Author’s Choice Awards in the process, which will be presented next year. More on the bridge can be found here. 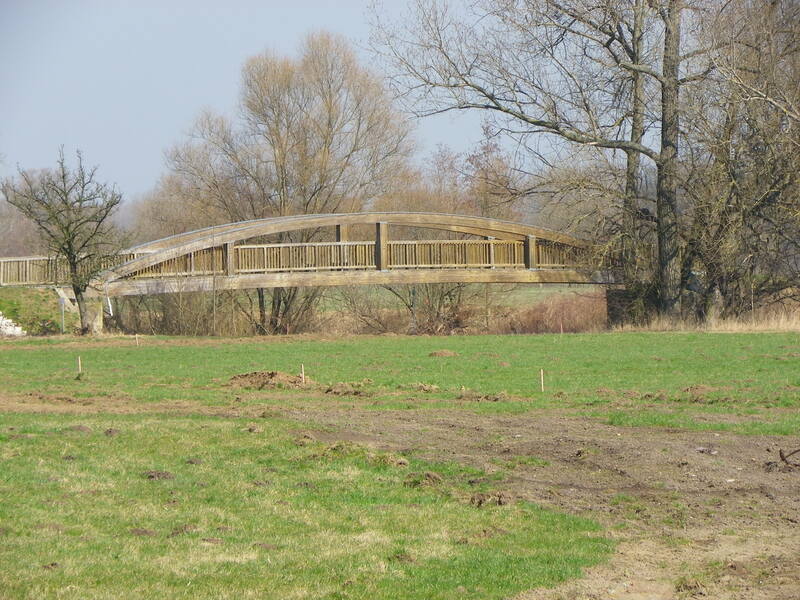 A photo of the bridge and the damage done by the beaver can be found here. 1891 Bridge near Cedar Rapids knocked into flooded Big Creek. June of this year saw unprecedented flooding in the Midwest, as heavy rainfall saturated the ground and turned quiet creeks into violent rivers flowing out of control. This includes the areas of Linn, Jones and Johnson Counties in east central Iowa, where floodwaters and erosion caused damage to two major highway bridges northeast of Cedar Rapids, and sadly the destruction of a prized historic bridge in the small town of Bertram. Located east of Cedar Rapids and accessible from highways 151 and 13, the town of 300 inhabitants is located on a key railroad line between Clinton and Cedar Rapids. 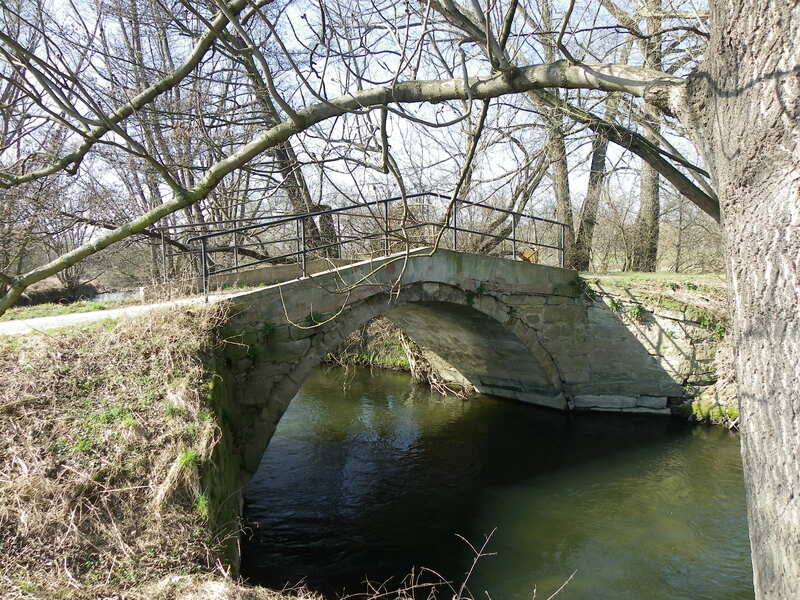 The quiet community prides itself in having four historic bridges located within a six-mile radius, all of them located along Big Creek, one of the tributaries that eventually empties into the Cedar River. The Ely Street Bridge, located on East Bertram Road just south of the railroad crossing is one of them. Built in 1891, the two-span Pratt through truss bridge, with Town lattice portal bracings and pinned connections, is a key example of a bridge built by J.E. Jayne and Son Bridge Company in Iowa City, located 30 miles south of Cedar Rapids. Born in 1838, John E. Jayne moved to Johnson County at the age of two where he settled down with his family on a plot of land in Graham Twp., according to county records. He started his bridge building business in Iowa City in the 1870s, with his company located on Gilbert Street. Many bridges built in Linn County were credited to his name, including three in and around Bertram. The red-colored Ely Street Bridge is the best known product built by Jayne, as the structure consists of two truss spans totalling 224 feet long and 14 feet wide. Plaques are found at the top center part of the portal bracings. The bridge is well-hidden but one will cross it right after crossing the railroad tracks. Heavy rainfall caused Big Creek to flood its banks, resulting in trees and other debris falling into the rushing waters. One of the larger trees knocked the two-span structure into the water on June 30th, cutting the truss bridges into pieces and the street off from its main access to US 151 and IA 13. Once standing while underwater, the truss structure is now in many pieces, and there is no word on whether the bridge will be rebuilt or scrapped in favor of a more modern structure. Already last year, attempts were made by Iowa DOT and Linn County to encourage residents of Bertram to “upgrade” the bridges, including the Ely Street Bridge. The offer of covering a wider portion of the cost to replace them was rejected by residents for they did not want to have an increase in traffic going through the community. The decision was sensible given the quiet setting Bertram has to offer, with its narrow streets and houses that are more than 70 years old. With the Ely Street Bridge washed away, the issue of the future of the crossing will indeed be brought back onto the table of the Bertram town council, Linn County and eventually Iowa DOT. 1. The bridge could be scrapped and replaced with a modern bridge, with the plaques being saved and showcased at either the museum or on the railings of the new bridge. There, the issue of the increase in traffic and the opposition to building a new bridge because of cost and historic significance will be discussed vehemently. 2. The second option is removing what is left of the bridge and not replacing the bridge at all. This would be a definitely inconvenience for it would cut the community in half with a crossing disappearing forever. 3. Then there is the third option, which is rebuilding the truss bridge, piece by piece, making it resemble the original crossing. 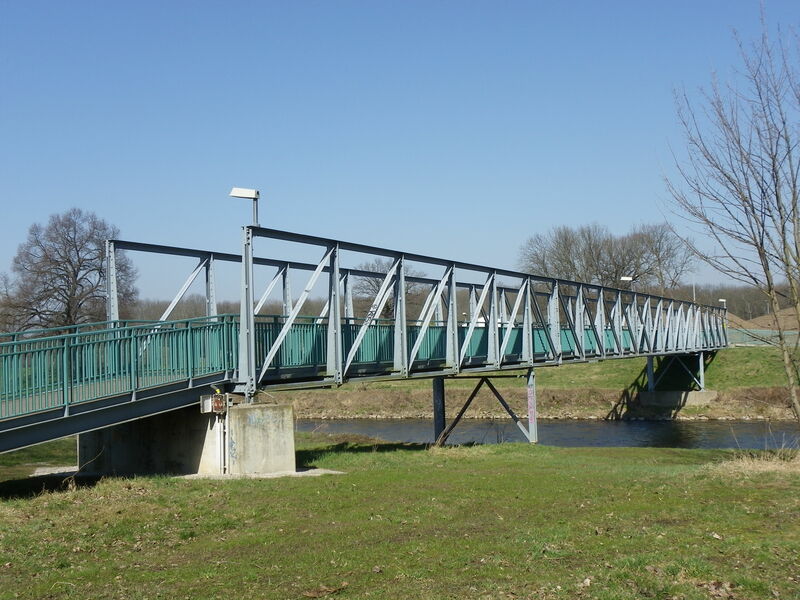 While that may be expensive to undertake, judging by the state of the truss spans, most of the pieces are salvageable, with the exception of the diaginal beams and portal bracings, which can be done by a local bridge builder. This option would keep the bridge listed on the National Register of Historic Places, the honor it had received in 1998. Even if only one of the truss spans is salvageable, one can either construct a replica of the lost span, as was done with the Motor Mill Bridge in Clayton County and the easternmost span of the Sutliff Crossing near Lisbon, both done in 2012. Both bridges had been washed away by flooding years before, and residents associated with both bridges raised funding and received help from state and federal authorities to rebuild them. That financial support is also available if one would import a historic bridge from elsewhere to replace one of the lost spans, whether that span originates from somewhere in either Linn, Jones or Johnson Counties or a couple river miles west of the bridge. There, the Blaine’s Crossing Bridge, seen from the Hwy. 151/13 Bridge, has been out of use for many years but still has some use left, judging by the appearance after the bridge was visited by two pontists within two years of each other. Given the many opportunities available, combined with the technical know-how available for rebuilding and restoring historic bridges, and the residents’ interest in a (preferrably restored) crossing at East Bertram Road, it will be most likely that the Ely Street Bridge will be rebuilt and the crossing will be reopen in the near future. The questions will remain though as to how to approach this problem. Will the bridge be rebuilt to its original form or (partially) replaced? How much money is needed to rebuild the crossing and where will the money come from? 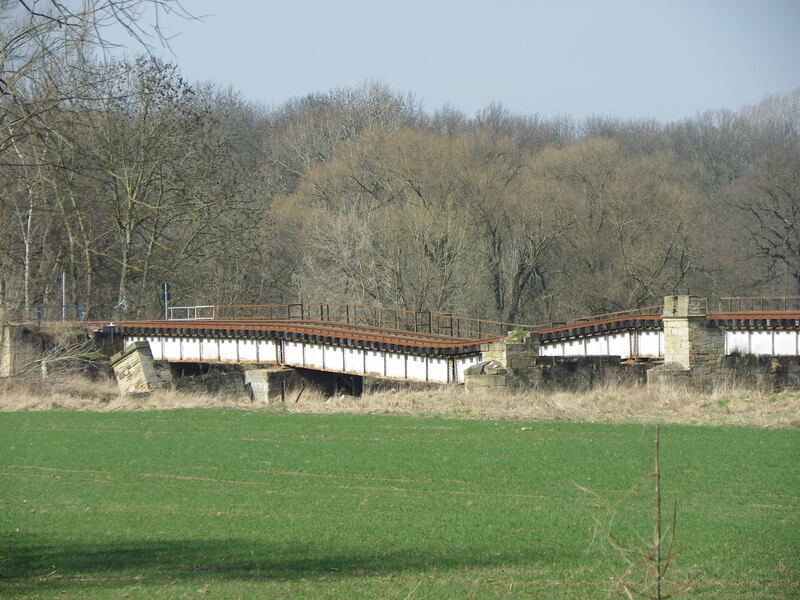 Will there be any campaigning for restoring the crossing, like on facebook, etc., and if so, how? And lastly, what will the rebuilt bridge look like: in its original form, in a replicated form, in an altered form, or in a completely new form? All these questions will need to be answered in the coming weeks and months before construction of the crossing can commence. This time, those affected will have their say as to how (new) crossing should be built. Author’s Note: Check out Bridgehunter.com for more pictures of the Ely Street Bridge, taken by the author and two other pontists. This includes a couple shots of the bridge after being knocked into Big Creek. 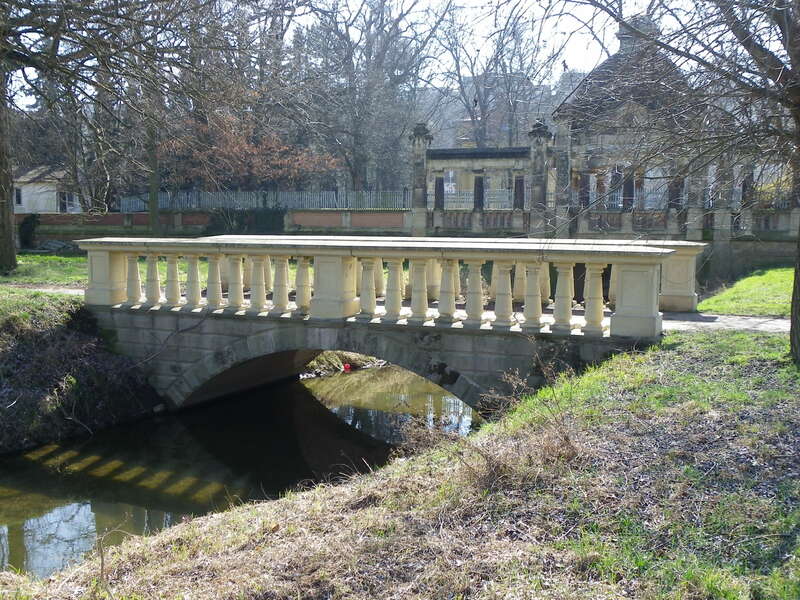 A tour of Bertram’s bridges can be seen here. There are more bridge types that make Des Moines one of the most populous bridges in the Midwest. 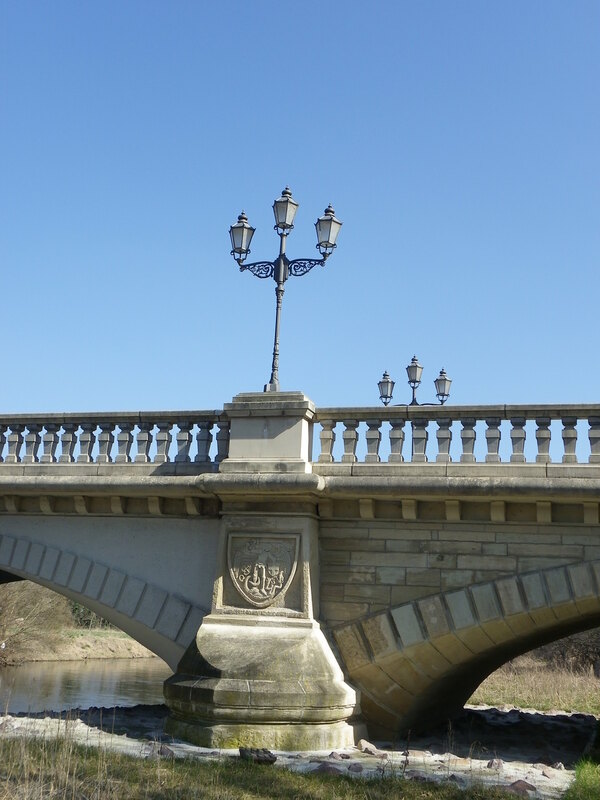 As we will see in this part, truss bridges were just as popular of a bridge design as the arch bridges that were built by James Marsh and company. 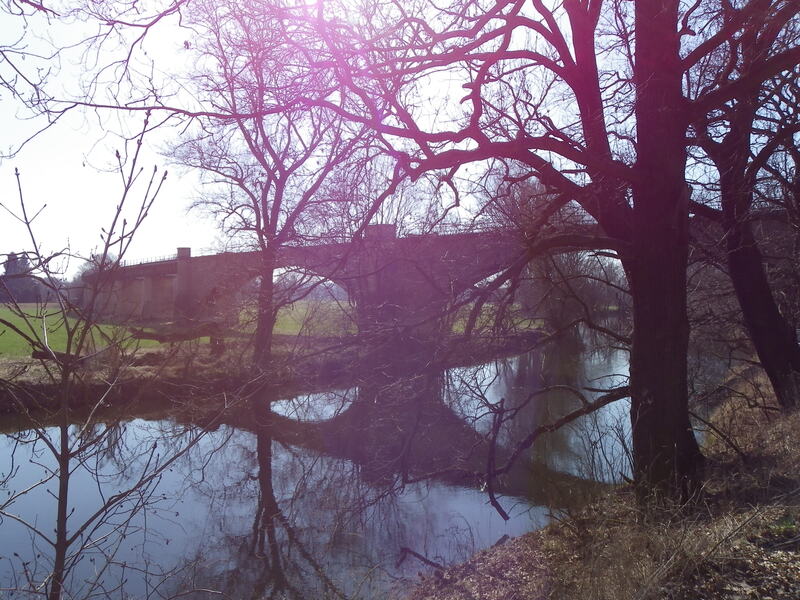 As many as 30 truss bridges were reported to had been built during the time span between 1870 and 1930 along the Des Moines and Raccoon Rivers as well as other tributaries, including those mentioned in the first two parts of the series. The majority of them featured two or more spans. And while more than half of them were Pratt designs, there were many exceptions to the rule. Already mentioned in part II there was the Post through truss design that had existed at Court Avenue before its replacement in 1917. 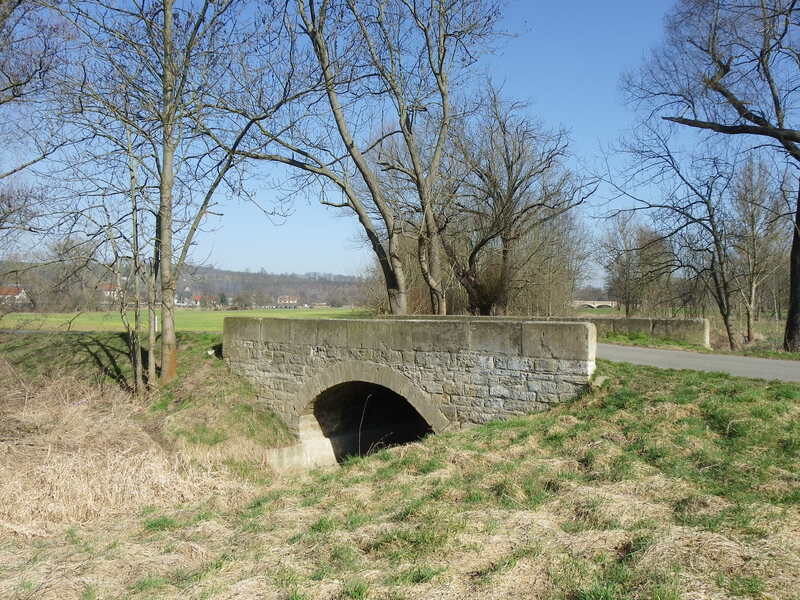 But like this bridge, the majority of the structures lack the information regarding its history, including the date of construction and the bridge builder. This was in part because of the fact that they were gone prior to the urban renewal period in the 1960s and after 1993. This is not good for many of these structures, like the 18th Avenue Bridge featured some decorative designs on the portal bracings, which were common during the period of bridge construction prior to 1920, when bridge builders could afford to leave their marks with ornaments and builders plaques. After 1920, with the standardization of truss bridges and the letter-shaped portal bracings (A, M and X-frames), these were seldomly used and can rarely be found today when travelling on Iowa’s highways. Today, eight bridges are known to exist in Des Moines that have a truss design, at least two thirds of the number that had existed prior to 1970. This does not include the CGW Railroad Bridge, which was demolished in its entirety last month. While some of the structures have already been mentioned earlier, the tour of Des Moines’ truss bridges will feature the ones not mentioned. Each one will feature a location, when they were built (and replaced), what they looked like and if there is no concrete information on the bridge builder, some assumptions will be made. As they will mentioned in the Iowa Truss Bridge Book project that is being compiled by the author, any information on the bridges will be useful. Chicago, Rock Island and Pacific Railroad Bridge at Hartford Avenue: This bridge can be seen from Hartford Avenue on the southeast end of Des Moines. The three-span subdivided Warren through truss bridge with X-frame portal bracings is the fourth bridge to be located at this crossing, for the earliest crossing was dated 1871. It was rebuilt in 1890 and again in 1915 with a four-span through truss bridge with A-frame portal bracings and pinned connections. While it can be assumed that the reconstruction in 1890 and 1915 may have to do with either flooding that damaged the spans or the increase in rail traffic, the current span was built in 1920 by the American Bridge Company and it most probably had to do with the destruction of the 1915 bridge, albeit more research and information is needed to confirm that claim. The bridge is 469 feet long and is owned by Union Pacific Railroad. However, it was part of the Rock Island Railroad with had a line connecting Indianola and Kansas City to the south, going through Des Moines enroute north to Albert Lea and Minneapolis. When the railroad company was liquidated in 1981, the line was acquired by Chicago and Northwestern, which in turn was bought by Union Pacific in 1995. 20 trains a day use this bridge. 18th Street Bridge: As seen in the picture at the very top of the article, this bridge crossed the Raccoon River at what is now Fleur Drive, southeast of the Central Academy. Before its demolition in 1936, the bridge featured four Camelback truss spans and was one of the most ornate bridges in Des Moines, let alone along the Des Moines River. More information is needed as to when the bridge was built (and by who) and why it was demolished. It is known that today’s Fleur Drive Bridge serves four-lane traffic and serves as a key link to Martin Luther King Drive and all points south of downtown Des Moines. Inter-Urban Trail Bridge: Built in 1902, this bridge spans the Des Moines River south of the Euclid Avenue Bridge. The structure features four spans of Pratt with pinned connections, yet three of the spans feature lattice portal bracings with curved heel bracings, while the fourth and easternmost span features V-laced portal bracings with a 45° angle heel bracing- quite possibly a span that was either brought in or built on-site to replace an earlier span destroyed. 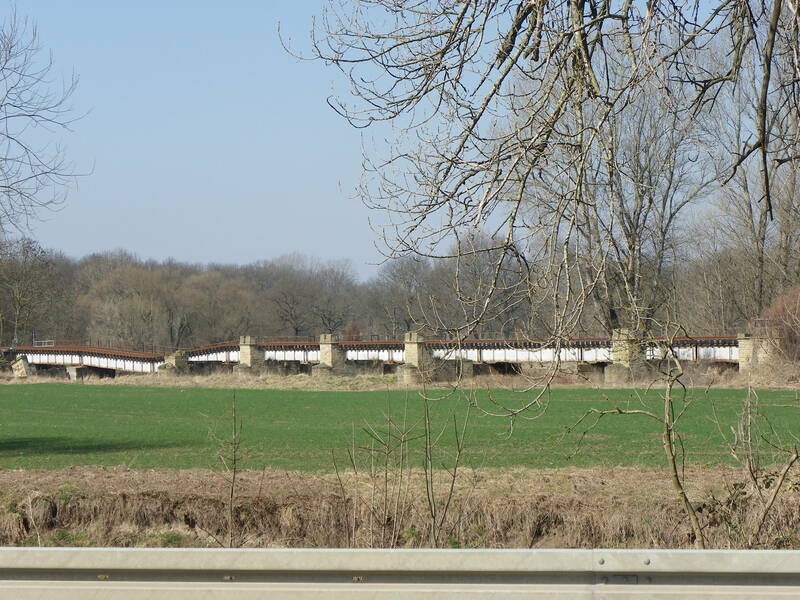 This bridge used to serve the Inter-Urban Rail Line, one of eight in Iowa accomodated commuters through the 1950s. This route connected Des Moines with Colfax in Poweshiek County, a length of 23 miles. Service continued until 1949, when the freight railroads took over and people resorted to the car or bus. 33 years later, the railroad line and bridge was abandoned, but the City bought both of them to be converted into a bike trail, which was opened in 1998. With the exception of the replacement of the approach spans in 2012, the bridge today retains its integrity and still serves bike traffic, while providing access to the Neal Smith Bike Trail, which combs the Des Moines River. 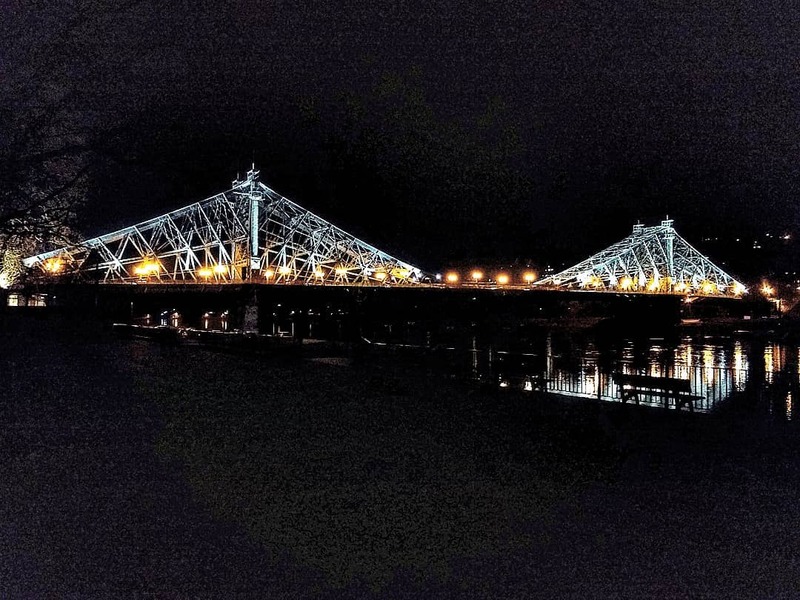 Commerce Bridge: Spanning the Raccoon River, this bridge featured four truss spans which included three Camelbacks with Howe Lattice portal bracings with subdivided heels and a Pratt through truss with M-frame portal bracings. 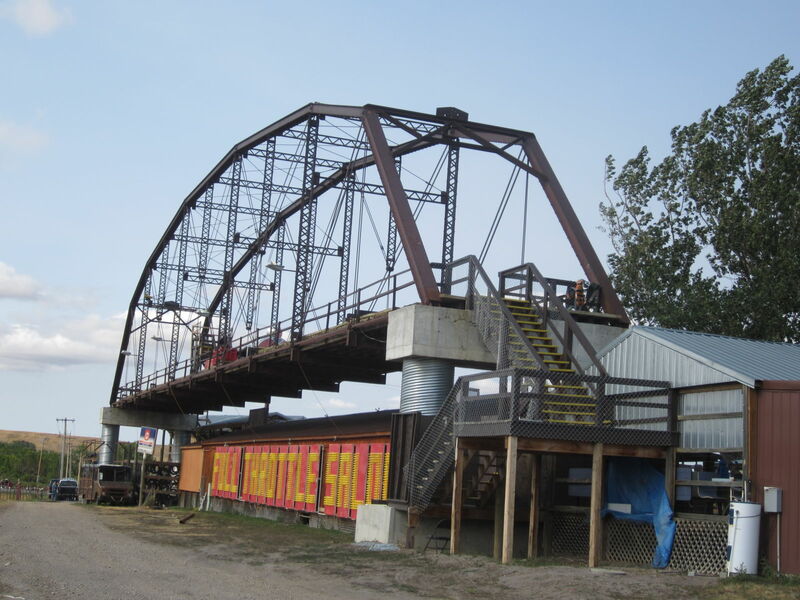 The latter was built at a later time, whereas the three Camelbacks were reportedly to had been built by the Clinton Bridge and Iron Works Company, one of many Iowa bridge builders that existed during the period between 1890 and 1930. It is unknown when they were built, let alone rebuilt, but records had it that the bridge was destroyed during the Flood of 1965. The bridge was later removed, and Commerce Street was rerouted to run along the Raccoon. All that remains are the abutments and the rapids where the bridge once stood. They can be seen as 105th Street southwest curves to the south. Iowa Interstate Railroad Bridge: Spanning the Des Moines River south of the Red Bridge and once part of the Rock Island Railroad, the Iowa Interstate Railroad Bridge was built in 1901 by the American Bridge Company and featured eight spans of pony girders totalling 625 feet. While it used to be a double-tracked bridge, the eastbound track was abandoned and fenced off in the 1980s and today, only one track is used. It replaced a four-span lattice through truss bridge, which had served one-lane of rail traffic and was built 30 years earlier. 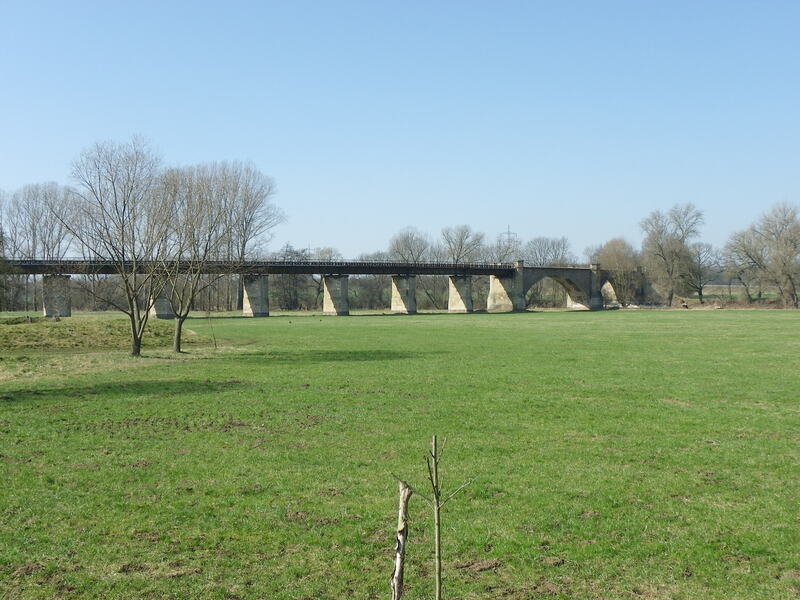 The future of this bridge is in doubt due to its sparse use, combined with the city’s plans to raise the dikes. Already the Red Bridge was raised four feet and the CGW Railroad Bridge were removed as part of the city flood planning. It would not be surprising that the bridge’s owner, Iowa Interstate Railroad would abandon the bridge altogether, making it the target for scrap metal. But it is unknown if and when that would happen. SW 63rd Street Bridge: Located over the Raccoon River between Brown’s Woods and Water Works Parks on 63rd Street in West Des Moines, this three-span truss bridge featured two pin-connected Pratt through truss bridges with portal bracings similar to the 5th Street Pedestrian Bridge, located downstream. It is possible that either George E. King or Clinton Bridge and Iron Works (because of the plaque on the portal bracing) had built the original span. Its northernmost span featured a Pratt through truss bridge with riveted connections and A-frame portal bracing. That bridge was most likely brought in to replace one of the original spans that was destroyed either through flooding or an accident. Little information was gathered about the bridge prior to its demolition and replacement in 1964, due to lack of interest in the history of the structure. 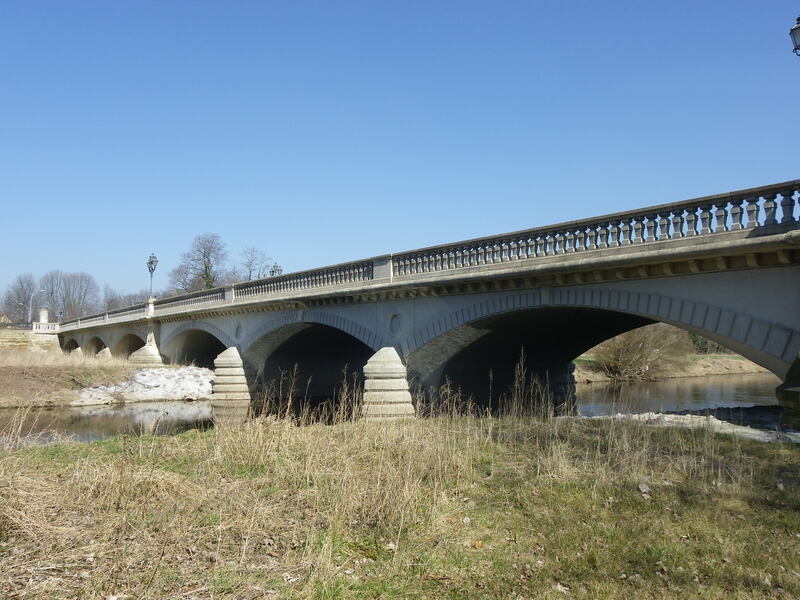 Had the historic preservation movement started 10-15 years earlier, it would most likely have been one of the first bridges eligible for the National Register of Historic Places. The National Historic Preservation Law was passed in 1966, one year after the replacement of this bridge was open to traffic. Waterworks Park Bridge: Built in 1922, this Raccoon River crossing is one of the key attractions of Waterworks Park on the south end of Des Moines, as well as the city’s bike trail network. The crossing is 320 feet long and features two 98 foot riveted Pratt pony trusses that used to carry vehicular traffic until its closure in the 1990s. In 1999, the City converted the crossing into a bike trail bridge and has remained in that fashion ever since. SW Ninth Street Bridge: This Raccoon River crossing is perhaps one of two bridges on this tour that has the least amount of information on its history, despite the fact that it was replaced with the current bridge in 1967. The structure featured three spans of pin-connected Pratt through trusses with Howe lattice portal bracings. Yet that is about it as far as further information is concerned…..
Old Highway 46 Bridge: This is the second of the two bridges that is missing information (including dimensions) and even more detailed photos than what is shown in the link. No information was found in the historic bridge survey conducted in the early 1990s. 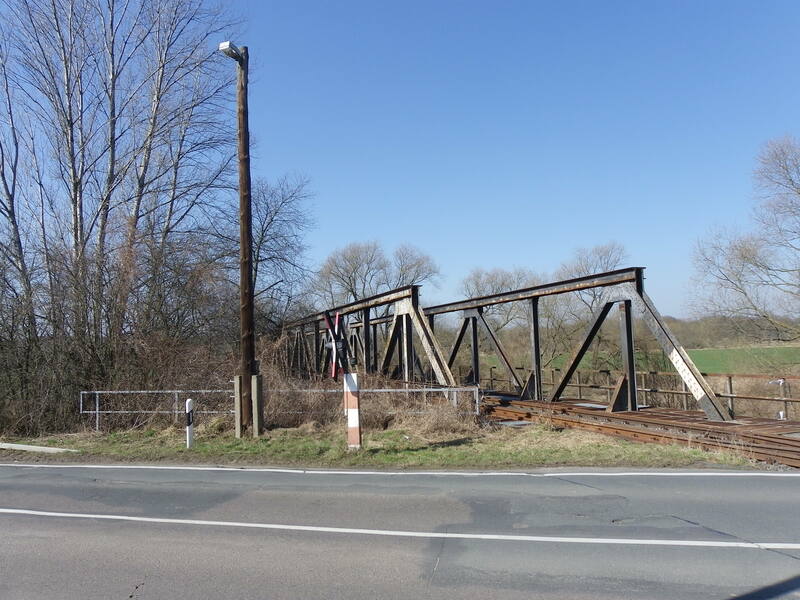 Located southeast of Des Moines, this multiple-span polygonal through truss bridge was built in 1938 and was removed 60 years later when the Hwy. 65 freeway opened. 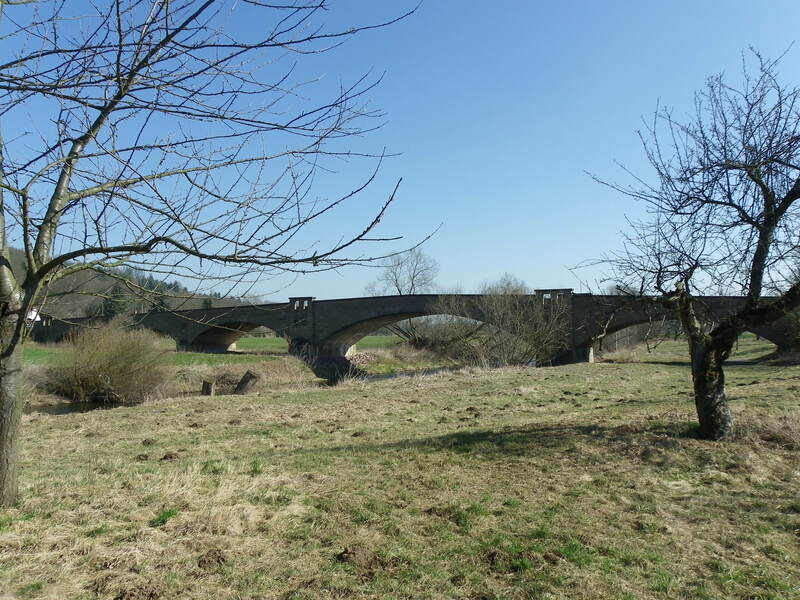 Other than that, there was no information as to whether a previous structure had existed before that, let alone who the bridge builder was that built the 1938 structure. It is known though that the removal of the bridge came despite protests from farmers, who wanted the bridge open so that they can haul farm equipment across it. Yet because the valley where the bridge was located was flood prone, safety precautions were taken and the bridge was removed. Today, portions of the highway exist on its original path from Avon to the river and from there to Des Moines, terminating at Hwy. 163. Interestingly enough, a railroad bridge located adjacent to the bridge was removed in 1968 after the railroad decided to reroute the line through Indianola enroute to Knoxville. A section of the railroad line exists but makes a dead-end at the power plant located on the north side of the river. Two Minneapolis and St. Louis Railroad Bridges: Located south of the Iowa Interstate Railroad Bridge over the Des Moines River, the crossings featured two four-span through truss bridges. The northern crossing was a quadrangular through truss bridge with Howe lattice portal bracings. The southern crossing featured Warren through trusses with A-frame portal bracings. Both of them disappeared before 1970. Ashworth Park Truss Bridge: This is one of three bridges that straddle Walnut Creek carrying Iowa Interstate Railroad through Des Moines (the other two are Pratt pony trusses). The 1897 Warren through truss bridge with Howe lattice portal bracings and riveted connections used to serve dual track rail traffic until the 1990s when it was reduced to only one track. The bridge still serves traffic and can be seen up close from the bike trail while passing through Waterworks Park. This sums up the tour through Des Moines. The truss bridge portion of the tour is rather the most interesting, but the most challenging if one wants to find information and photos of the structure. As some of the structures will be included in the Iowa Truss Bridge Book project, if you have any information that is useful for the project, or for other people who are interested in bridges in general, you can leave a comment here, or you can contact Jason Smith at the Chronicles at flensburg.bridgehunter.av@googlemail.com. Aside from that, it is hoped that people will have an opportunity to visit the bridges while in Des Moines and listen (or read) the stories involved with each of them, for the bridges span a total of 160 years and three periods, both in terms of materials (wood-iron/steel- concrete) as well as the period of bridge building (trusses-arch-modern bridges). Through the interest in history, you are doing more than just collect stories, you are sharing them with others as well, for there is no such thing as no interest in history. Without history, we are ignorant and a group of people with no identity, no pride and no soul. We take pride in history to ensure we know who we are and bridges are an integral part of our history. Author’s Note: More info can be obtained by clicking on the links marked in the heading and text. Special thanks to John Marvig for photographing the bridges and allowing usage in this article. Of all the areas in the world that have been prone to flooding over the last 15 years, including those along major rivers, western Canada was one of the places where flooding was least expected. During the time span between the 20th of June and present, many small to medium sized rivers became large bodies of water, with raging rapids and mudslides, taking towns and large cities by surprise, when no one expected it. For many regions, this is the worst flooding since the 2005 Floods, which was considered the 100-year flood. The hardest hit areas were places in the Provinces of Saskatchewan and Alberta, where many communities located next to rivers were underwater in a matter of minutes. All of Calgary, the city of 3 million inhabitants located at the junction of the Bow and Elbow Rivers was flooded out (as seen in a video clip shown here), with other communities, like Medicine Hat, Canmore and High River sustaining considerable flood damage despite people fighting to keep the floodwaters in the river. The cost of repairs and reconstruction is expected to be in the billions of US Dollars and like the areas in Europe that are drying out from their Great Flood, Canada will most likely enter a recession for cities like Calgary, considered engines for economic growth, will suffer from millions of Dollars in lost revenue. Many of Calgary’s bridges, both old and new, were damaged substantially, as the Bow and Elbow Rivers turned the metropolis into Venice, and the bridges were undermined either through the severe erosion of the abutments, a span or two being washed away, or in this case, water currents undermining one of the piers of the Bonnybrook Railroad Bridge, spanning the Bow River next to another bridge. While the bridge was inspected 18 times during the floods, it would have needed a 19th or 20th check-up to see that the pier was instable enough to cause two spans of a five-span pony truss bridge to partially collapse on 27 June in the afternoon with train coaches parked on the bridge to hold down the weight. The owner of the bridge, Canadian Pacific (CP) worked with haste to pull the wagons off the bridge. Despite this questions are being raised as to whether the bridge inspections were thorough enough, and that the extra work would have been needed to see that something was seriously wrong with the 1920 structure. It is expected that a new bridge built 4-6 feet higher- just as high as its neighboring bridge located 150 feet from the collapsed span- will be needed to accomodate rail traffic. A link to the story with videos can be found here. More information on the fate of the Bonnybrook Bridge will come here on the Chronicles. Many pedestrian bridges including a pair of suspension bridges in and near Calgary were destroyed during the flooding. This include a couple at Fish Creek Provincial Park. Consisting of two sections straddling the Bow River featuring a dozen bridges, a zoo, golf course, bike trail and a natural area, this area was no stranger to disasters, for seven bridges on the western section of the park were wiped out during the 2005 floods and had to be replaced. Even though they were for the most part spared the flooding, three bridges were severely damaged or were destroyed this time around. This includes a bridge whose structure and abutment were completely washed away down the river, and a newly built MacKenzie Pedestrian Bridge, built in 2007. All that is left of the bridge is its Warren through truss span above the river as the approach and abutments were washed away. 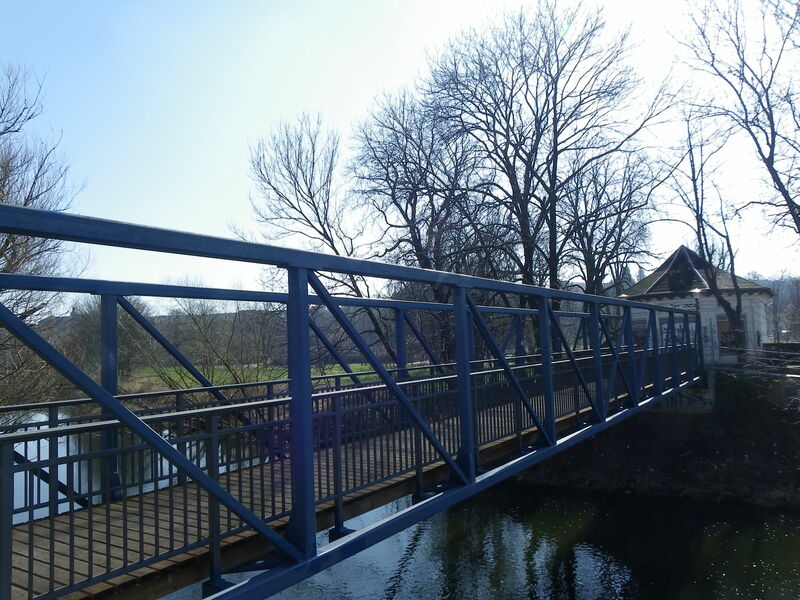 Another pedestrian bridge near the park, a beam bridge, suffered a similar fate. The cost of repairing or replacing the bridge represents a fraction of the cost for rebuilding the park, which is expected to be in the millions of US Dollars and will take at least 1-2 years to be fully restored. More information about the park and the bridges can be found here. While this bridge represents an example of a bland plain grey concrete bridge built a few years ago to replace a previous structure, this structure made headlines in another way, for a spectator filmed a two-story house that had been washed into the creek and was floating at over 80 kilometers per hour when it encountered the structure and its center pier. Upon impact, the house was reduced to a pile of rubble. While the damage to the bridge was only slight, the owner of the house will have to go to the drawing board to design a new house. A video of the impact can be viewed here. To summarize the whole event in one sentence would be difficult except to say that the region is a whole mess right now, and people are working to rebuild their livelihoods. A difficult road is ahead of them for many homes, buildings and even bridges, damaged by the floods may have to be torn down and replaced. Already there was talk of Calgary tearing down over 100 buildings damaged by flooding. Yet this is only part of the rebuilding process as local and provincial governments and residents alike are working to ensure that the next flood of biblical proportions will not destroy the region again, for the third time may force many to leave the region for good. However, such preventive measures will come at a price, which includes redrawing the landscape and infrasturcture to ensure a three-peat will never happen.